Fathers and sons can share many important milestones in their lifetime together. These milestones turn into memories that they’ll cherish forever. 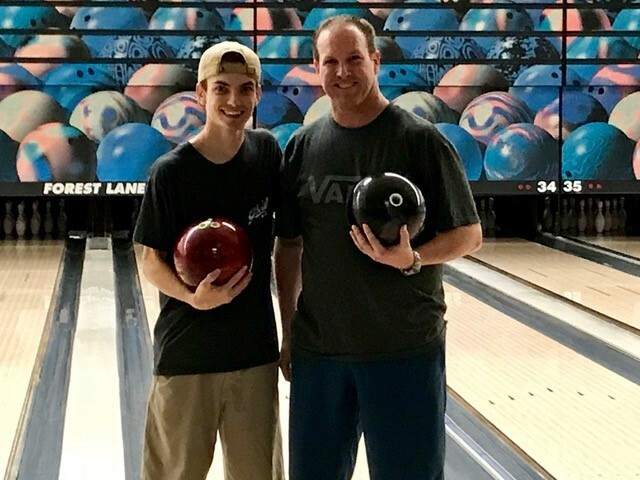 Recently, Kevin and Travis Webster shared a milestone on the lanes. They have been bowling together on the same team for two seasons and they both started stringing the strikes together. They both shot 300 in the same game. Kevin: I started bowling 40 years ago and stopped bowling in 1997 when I was starting to raise a family and purchased my first home. I started bowling again in 2016 when Travis started getting interested in the sport. Travis: I started bowling less than two years ago. Tell us about the night. Kevin: It is a 3 person, 595 max scratch league. I started out the night with a 194 game but felt I had a pretty good look. Game 2 I started strike, spare in the 2nd, then struck out until a left a 7 count in the 12th for a 277 game. Game 3 Travis and I got on a roll and just kept striking. It wasn’t until about the 6th frame, the thought of us both bowling 300 games entered my mind. I have previously bowled 300 and 818 in league play many years ago before I stopped bowling and rolled a 300 in a tournament a few months ago along with a couple of other 300’s while practicing. I was excited for Travis because he only started bowling in 2016 and had the chance at a 300 game. As the strikes kept coming, so did the crowd and other league members. Travis struck out in the 10th and shot the 1st 300 of the league. We celebrated for a minute, but I still had some work to do myself. By the 10th frame, the whole house was standing behind our pair. I threw a good ball in the 10th. In the 11th, I left a lazy ten pin, but the head pin messenger came off the side board, rolled and knocked the 10 pin down just before the rack came down. The crowd went crazy. In the 12th, I threw a great ball flush in the pocket. The crowd went nuts again and high five from everyone. In the 4th game, I started with the front 4 strikes, and finished with a 236 game. 196-277-300-236 = 1007 4 game series. What ball were you throwing? Did your fellow league bowlers notice what was happening and cheer you on? Kevin: Yes, you could see people looking over and starting to talk around the 6th frame. By the 10th frame, everyone around us had stopped and was standing behind our pair, cheering after every strike. The support and excitement of seeing father and son, on the same pair, during the same game, trying to shoot 300’s was amazing. Travis: Yes, I’m sure they all noticed even before I did. It was about the 8th frame when I noticed our neighboring pairs backing off and letting me bowl uninterrupted. After my 12th, the excitement really kicked in as all the high-fives and congratulations’ poured in. When you both had finished your games what was your reaction or the first thing you said to each other? Kevin: I was the first one to greet Travis after his 300. I just hugged him and told him how proud of him I was. This was only the 5th week of his second season, and to see the excitement on his face was priceless. Travis: I think we were both so excited there weren’t too many words as we just shared a hug right behind the approach. I’m sure this is a night you will always remember. In your own words, what made this night so special to you? Kevin: The whole reason I started bowling again after a 20-year absence was to spend time with Travis and compete in a sport that I spent a great deal of time early on in my life. Never in my wildest dreams did I ever imagine that both of us would shoot 300 games during the same game. To be able to share such a rare accomplishment with Travis is unbelievable and special. I think about the moment every day. No matter what happens from here on out, we will always share that amazing night. I couldn’t be happier and more excited to share that moment with my son. Travis: It was just so unbelievable to have bowled my first 300 game with my dad there watching and bowling with me. And for him to bowl a 300 of his own and share the moment with me was something I’ll never forget.